What are the differences among Room Types? What is the size of the beds in each room? Is a kitchen furnished with utensils? Are consumables supplied in the rooms? Are Internet and telephone connections available? Is there an entry phone and mailbox? Are there a baby crib and a high chair? Is a smoking room available? Is there a restaurant or a gym? Is there a parking lot available? Standard Studio: A twin room (403ft2) hotel type plus kitchen space. Deluxe Studio: More spacious than Standard studio (480ft2) includes a living space furnished with a sofa One Bedroom Suite: A suite room (768ft2) hotel type plus kitchen space. All beds are full sized twin (48"wide x 79"long each). An extra bed can be added to One Bedroom Suite, but not to Standard or Deluxe Studios. It is furnished with one IH range table, basic cooking utensils and appliances and some tableware. However, neither food nor seasoning is stocked. For those groceries you can go to a nearby supermarket. For more information on what is supplied in the kitchen, please check the equipment list on the page of each room. Necessary consumables such as: toilet paper/ boxed tissues/ garbage bag are supplied. Others such as: a shampoo or body soap/ toothbrushes/ shaving set are not supplied. Bring what you need with you, or you can purchase them at a nearby supermarket. Every room has WiFi Internet access. The telephone in the room is able to make and to receive outside calls, so the front desk does not handle any calls. You will get your telephone number at check-in and you’ll be charged with your call fees in total at check-out. The telephone does not fax capabilities. Mailboxes (with lock) for each room are situated at the main entrance. There is also an entry phone with a camera and a verbal communication function in each room. We don't have a baby crib to rent out, but a high chair and a humidifier are available at an extra charge of 2,000yen each. The number of it is limited, so let us know what is needed at the time of your reservation. 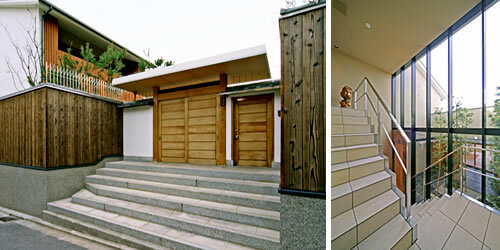 As JIJUDEN is equipped with neither an elevator nor an escalator, the whole premise is not barrier-free. You need to walk upstairs to the outside entrance or to the second floor. JIJUDEN is not capable of handling wheelchairs and may be difficult for the physically challenged. Left: Steps to the outside entrance. / Right: Stairs to the second floor. JIJUDEN is a rental apartment, so not equipped with any facilities of hotels like a restaurant, a gym or a spa. You can book our monthly parking lot if you rent a car in Japan. The rent is 20,000 yen per month which must be paid with the room rent. Since we have only a few parking lot, please be sure to ask the availability us before you book. In this case, you have to get the pass permit because there is restricted area on our frontal road. We will help to complete the issuance procedures of the permit after you arrive. Documents required is the copies of your driver's license and car registration. You can also use a neighborhood coin parking lots. in this case, you don't need the pass permit because the parking is outside of the restricted area. It may become better choice if you go out by your car frequently. 8 am to 8 pm: 200 yen/30mins. 8 pm to 8 am: 100 yen/60mins. * The maximum cost is 800yen on weekdays. * This rate is for reference only and are subject to change by the operating company without notice.